This blog post presents a methodology for opening (loading) a customised set of Modelica libraries in Dymola with a single click. For demonstrating this method, VeSyMA® (Vehicle Systems Modelling and Analysis), a suite of commercial Modelica libraries is used. For making this feature appear by default in the Dymola menus, an additional method is also presented. It is shown that with the aid of the presented method and by carefully calling libraries in a proper order, it ensures that with a single click a customised set of libraries are only loaded into the Dymola Package Browser. Keywords: Custom, Dymola, Menu, Startup, Modelica, Library. Figure 1– Dymola File Menu. File > Open… helps to manually browse a package.mo file which is normally stored within a Modelica library folder. This Open command reads the contents of a file and opens this library in Dymola Package Browser. By the end of the reading process, Dymola will automatically change the current working directory to the directory of the opened file. File > Load… works in the same way as the first option above but keeps the current working directory. File > Libraries display a menu with shortcuts to libraries configured with Library Management option marked with a red box in Figure 1. Using any of the three methods above, we can open an individual and/or multiple libraries in Dymola Package Browser manually. If any loaded library uses a class from another library, i.e. it is dependent on it, Dymola will search for those additional libraries in the directories of DYMOLAPATH or MODELICAPATH. It can be time-consuming to manually load a preferred set of libraries using any of the three methods above. You may also experience version conflicts as Dymola does not permit multiple versions of the same library within a Package Browser. 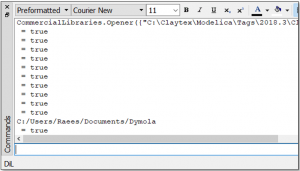 Therefore, the rest of this blog post is dedicated to presenting a methodology for opening or loading a customised set of Modelica libraries into Dymola Package Browser with a single click. When we start a non-customised Dymola session, it typically opens in the Modeling tab as shown in Figure 2. 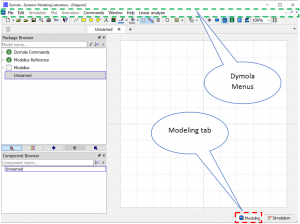 Figure 2– Dymola 2019 FD01 GUI Modeling tab. However, it is possible to extend this graphical user interface (GUI) of Dymola by configuring your own menus. I will show you how to create a function to open a set of libraries and add this to a custom menu. The example code provided below will load a selected set of libraries with the help of Modelica functions. It builds upon the previous blog post Creating a function for loading libraries and is adapted to create a package structure called CommercialLibraries. Note: The above Modelica code can be downloaded here and saved to your preferred location. This package has a subpackage, Tags and function, Opener. The Tags package has its own subpackage named as Open. The function Open provides the path of the libraries, and the function Opener executes the opening task. By using one of the aforementioned library opening methods (say, File > Open…), the above downloaded code (CommercialLibraries) can be loaded into Dymola Package Browser and it will look like the one shown in Figure 3. Figure 3 – The fully expanded view of the CommercialLibraries package in Dymola Package Browser. Comparing to Figure 2, at the end of the provided code, ‘annotation (__Dymola_menu=true,’, helps to include an additional menu in the Main window Modeling tab of Dymola as highlighted in Figure 4. Figure 4 – A cropped & customised version of Figure 2. Figure 4 depicts cropped and customised Dymola menus after opening the previously downloaded CommercialLibraries package in the Dymola Package Browser. Moreover, in the code, by changing ‘annotation (. . ., Protection(hideFromBrowser=false),’ to ‘annotation (. . ., Protection(hideFromBrowser=true),’ and then clicking anywhere within Dymola Modeling Window, the recently manually opened CommercialLibraries package will hide from the package browser as in Figure 5, but it will continue to exist in the Dymola Modeling Window until the closing of this Dymola session. Figure 5 – Edited CommercialLibraries code and the package is no longer visible in the Dymola Package Browser. To be able to view this hidden package in the Dymola Package Browser, without editing the code, please refer to Appendix A. Optionally, you can save the above changes in CommercialLibraries using File > Save option in Dymola, before navigating through the rest of the blog. Figure 6 shows selection options available under CommercialLibraries package. Figure 6 – Selection options of CommercialLibraries package. Figure 7 – Dialog box generated by clicking on Open in Figure 6. If we press Execute or OK, Dymola will call the Open function which in turn calls Opener function in the provided code. This action will automatically switch Dymola from the Modeling tab to the Simulation tab and the following outputs will be printed in the Commands section of the Dymola simulation tab. Figure 8 – Command log pane of the Dymola command window. 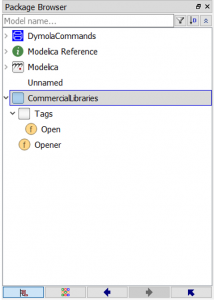 By switching back to the Dymola Modeling tab, the following list of commercial libraries will be opened in the Package Browser. Figure 9 – Requested commercial libraries opened in Dymola Package Browser with a single click. To make the CommercialLibraries package appear by default in the Dymola menus for each new Dymola session, the dymola.mos file needs to be modified. 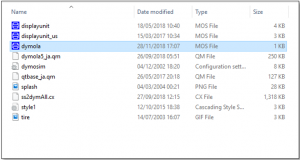 Prior to doing this, it is recommended to create a backup copy of the ‘<Dymola installation directory>\insert\dymola.mos’ file, the original folder look like the one shown below. Figure 10 – Dymola 2019 FD01 the original ‘insert’ folder. Make a copy of dymola.mos from the folder <Dymola installation directory>\insert and save it in a non-write-protected area of your hard drive. Right-click the copied dymola.mos and select Open with > Notepad. Figure 11 – The original dymola.mos file. Then the modified script looks like the figure below. Figure 12 – The modified dymola.mos file. Followed by save and close dymola.mos. Then, go back to the insert directory, rename the existing dymola.mos file, then manually copy the edited dymola.mos file back to the folder <Dymola installation directory>\insert. Note: To perform the above steps you must have administrator rights. Now open a new Dymola session, a window similar to Figure 5 will be opened, but the code may be hidden if you were previously saved CommercialLibraries package after editing the code. 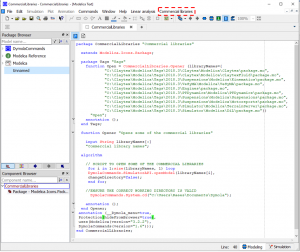 This blog post presented a methodology for opening/loading a customised set of Modelica libraries into the Package Browser of Dymola with a single click and demonstrated a method to customise Dymola startup configuration. In order to see the hidden Modelica package in the Dymola Package Browser, go to the Package Browser option available in Edit > Options… command in the Main window Modeling tab of Dymola. After clicking on the Edit > Options…, the following popup window will appear. Figure A – Edit > Options… popup window. In Figure A, tick Show protected classes and then click OK. 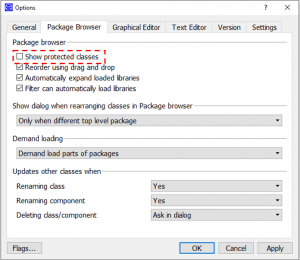 This will open all the protected classes that include CommercialLibraries and other packages in Dymola Package Browser.